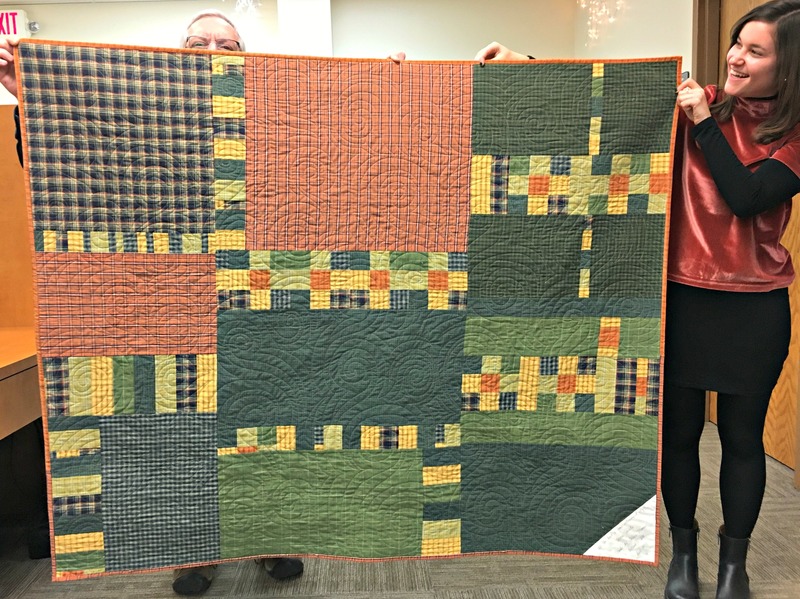 I’ve worked with Liz for more than 10 years so a special gift for her retirement was a must. I had six shirts selected for the Seven Shirts + Seven Steps quilt for more than 3 or 4 years (seriously marinating this one!) 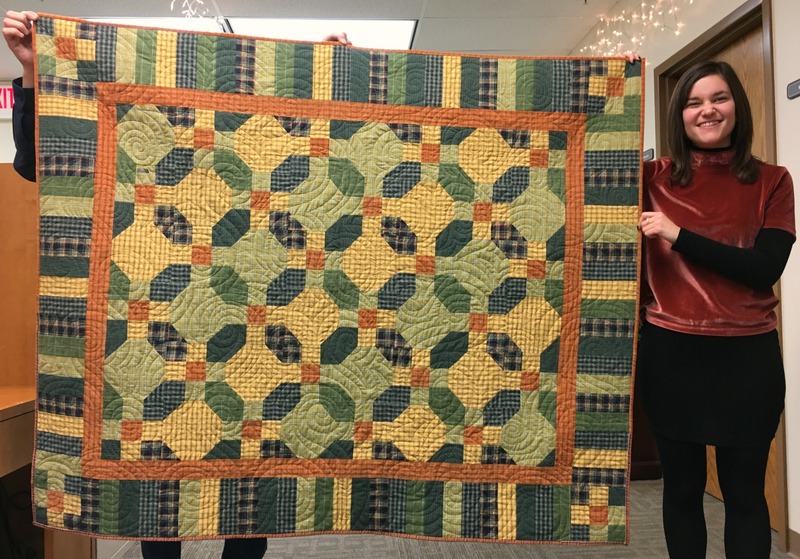 It’s exactly the kind of quilt Liz would appreciate as she’s into recycling, reusing and upcycling. In the years since I pulled the six shirts, I’ve thrifted quite a few more so I wasn’t surprised I was finally able to find the perfect seventh shirt! 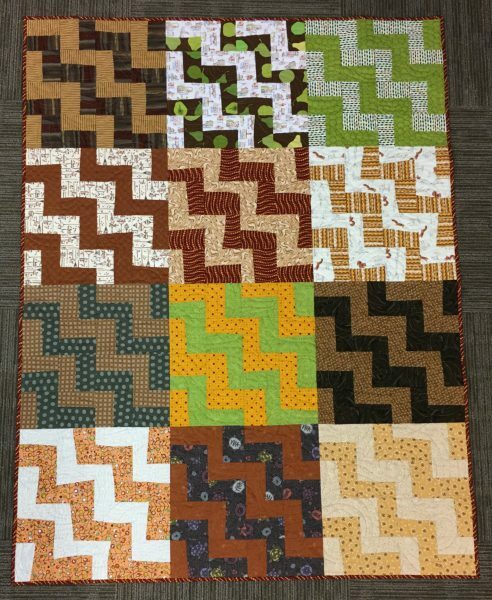 I followed the pattern exactly except for the layout…I arranged the blocks so the light snowball blocks are in diagonal rows vs alternating like the pattern shows. I like the back maybe more than the front 😉 I finished this Dec 29, 2017 and I’ll admit to still be sewing down the binding during the party 😉 Yes, a slight miss on the deadline for this one! 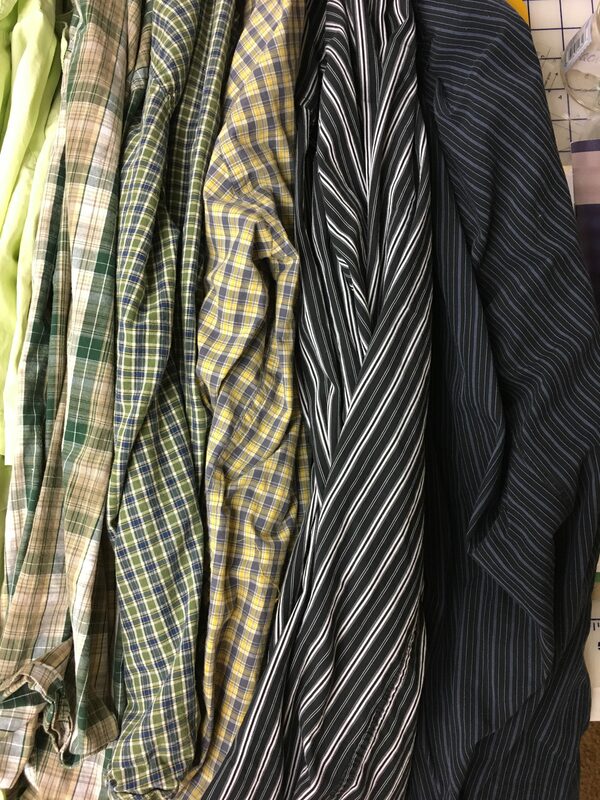 It was a good day at the Goodwill Clearance Center last week as far as cotton shirts go 🙂 I snagged two black striped shirts and some nice green plaids. 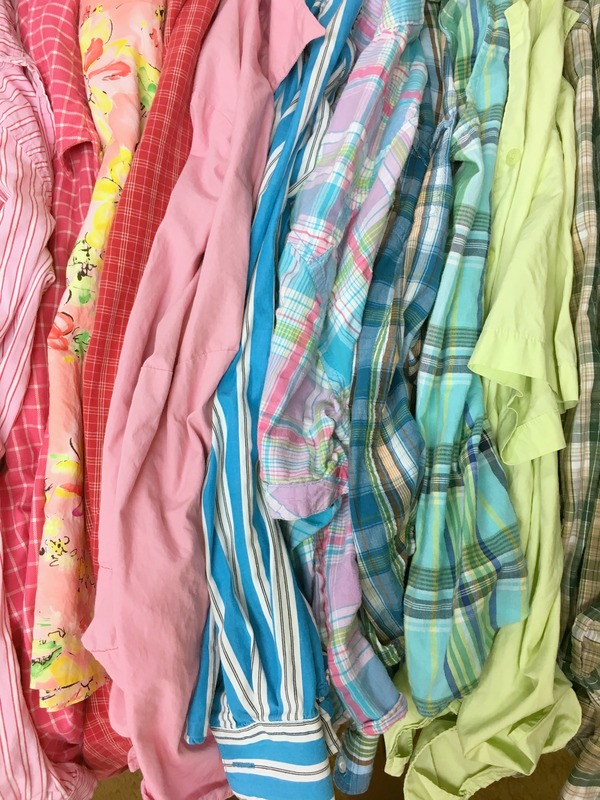 There were three colorful madras plaids in the teal/blue family, a wonderfully bright blue stripe and a big variety of pinks! 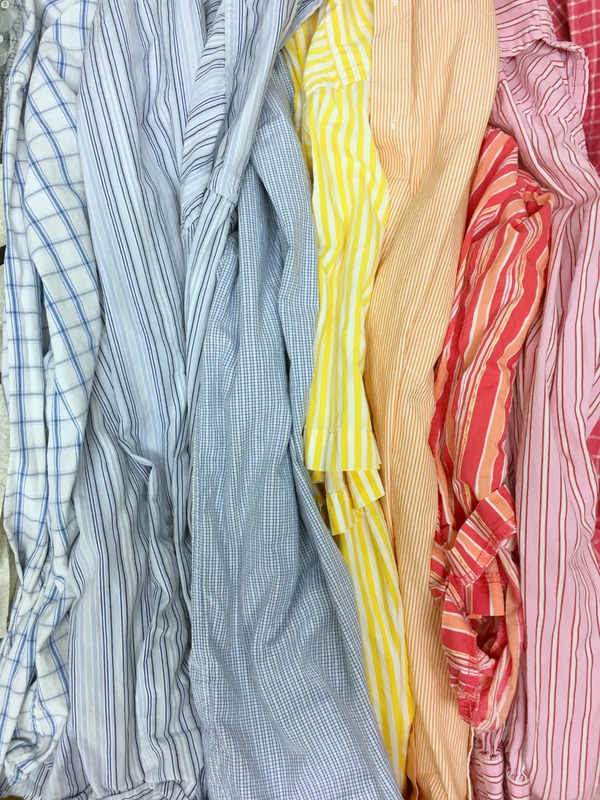 And a couple of solid shirts in bright green and pink, nice! 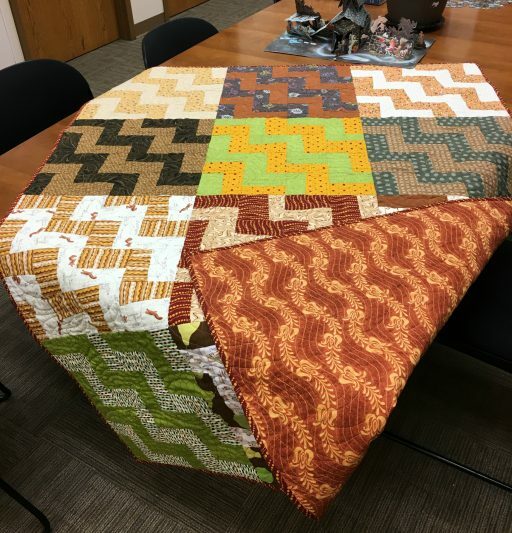 I volunteered to quilt a guild QOV quilt top made using Jan’s (The Colorful Fabriholic) Log Cabin Triangles (LCT) free tutorial. 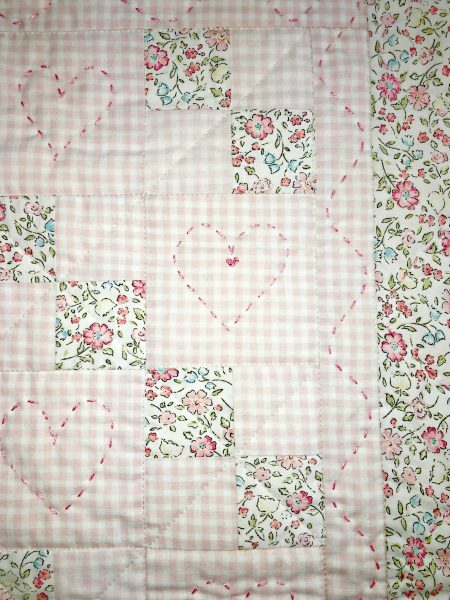 I’m quite pleased with the quilting. 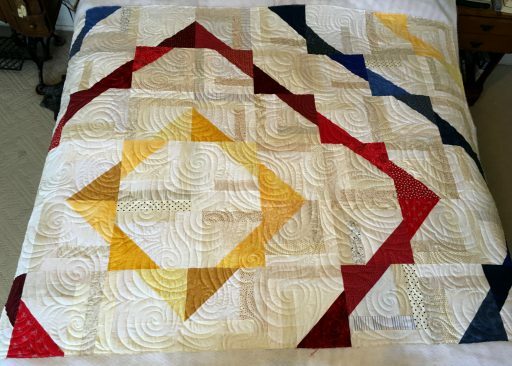 I used the basic swirl from Jamie the Quilter’s Apothecary……the link to the first video is here. I really like this free motion design. This quilt is from a workshop by Sujata Shah that I took along with Julie. It’s Zig Zag, from Sujata’s book, Cultural Fusion. I finally completed Ziggy, Zaggy, Ziggy, Zaggy, Oi, Oi, Oi (chant from the Man Show…taken from the German beer hall chant) in Oct 2017. 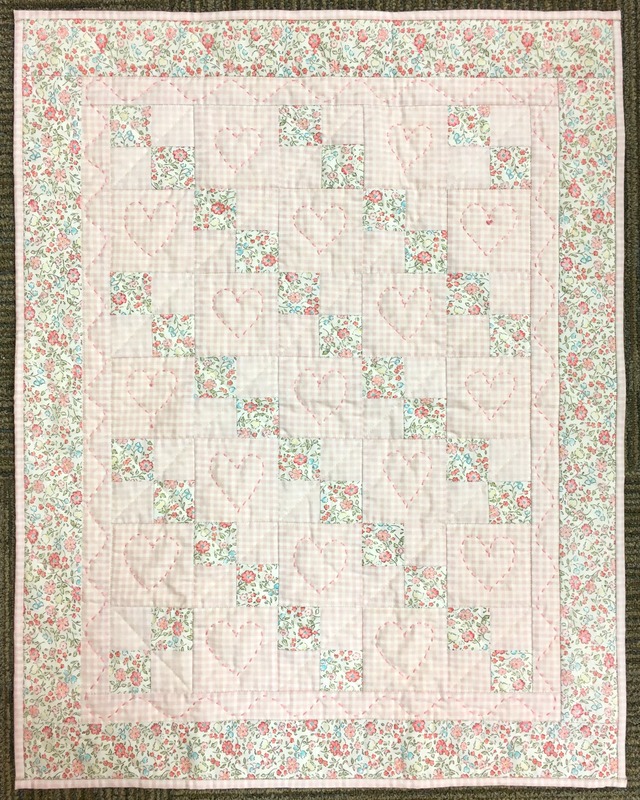 A co-worker gave me a soft pink gingham dust ruffle she was getting rid of (yes, people give me shirts and other items for quilting, he he he). I put the gingham down next to my pile of recent thrifted shirts…..and it looked perfect with a sweet flowered shirt. That was a sign, right? 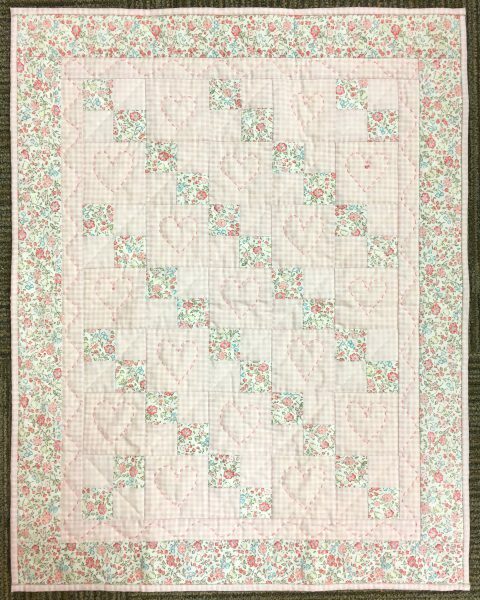 So I made a doll quilt…..with a oops that I decided not to fix, gasp! I quilted it with my walking foot in straight lines and then added some big stitch quilting with perle cotton. I threw in some French knots, just for fun.